Ralf (in the red) and Clarke. 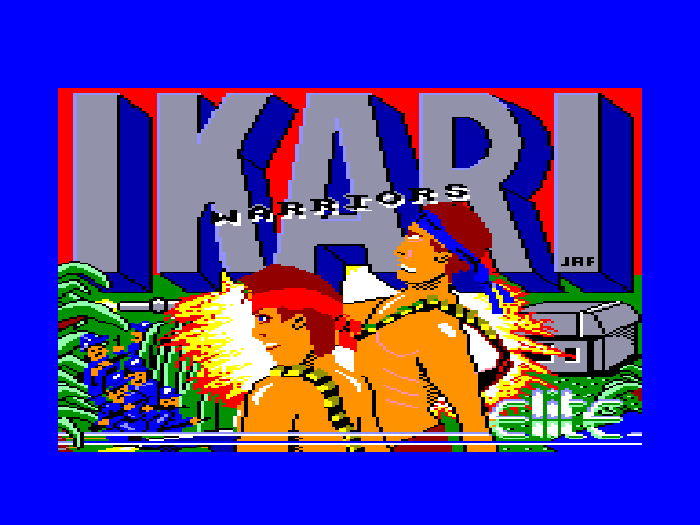 Ikari Warriors was a run-and-gun shooter that started life as an arcade machine in 1986. There was a free standing machine and also a cocktail table style cabinet (the ones in pubs you could sit at and rest your pint(s) on). 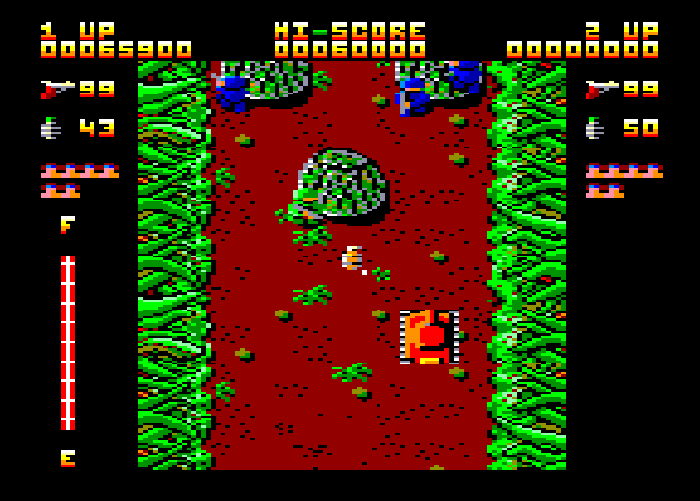 It soon made the jump over to the home computers of the day including conversions for the C64, NES, Spectrum, Amstrad CPC and in 1987 for the Amiga and Atari ST.
None of the conversions matched the arcade machine for it’s graphics, sound and most notably it’s revolving joystick that allowed you to fire in a different direction to which you were moving. Today we’ve been hammering seven shades out of the very playable Amstrad CPC version. Watch out for the camouflaged fella by the rock who (unlike his mates) had the good sense to put on his green uniform this morning. 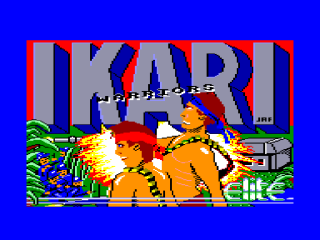 You take on the character Ralf and are tasked to romp through the jungle defeating an entire army in full-on Rambo style until you reach and rescue Colonel Cook in the village of Ikari. It’s a 1 or 2 player game so back in the day if you had a pal over they could take on the role of Clarke and avoid your Mum coming in and delivering the whole “are you letting Johnny have a go” line. 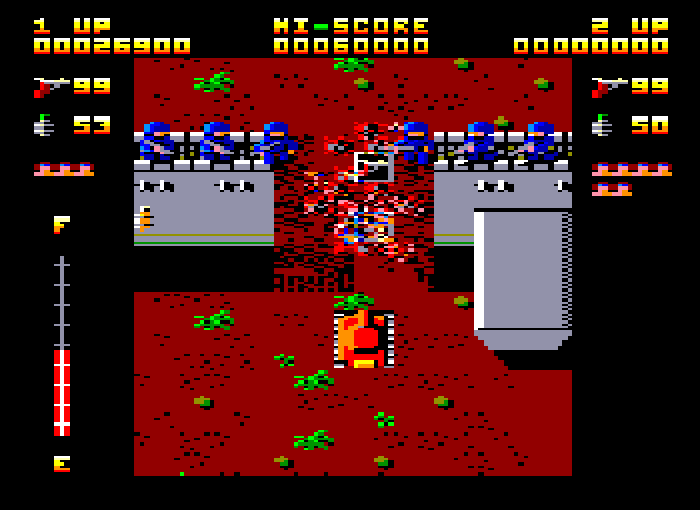 Your enemies aren’t just going to let you stroll up and rescue the Colonel with no bother though, within seconds of starting you’ll be experiencing all manner of ordnance coming your way courtesy of soldiers, tanks, helicopters and static bunkers. It may appear from this image like we’re running away. Not so, we’re drawing this helicopter into a trap that’s going to end very badly (for him). This situation is somewhat eased by the fact that bullets and rockets travel very slowly and can often be out ran. A few blokes sitting on a wall aren’t going to stop Ralf, especially when he’s inside a tank. You can of course give as good as you get. As well as firing your gun you can also hold down the fire button and unleash a grenade with that has a satisfying whistling sound as it flies through the air and then explodes with an equally satisfying cloud of hissing sparks that wipes out everything in range. If that’s not enough for you you can jump in tanks and drive around like a maniac running the enemy down while their bullets (but not grenades) bounce off you. The gameplay is enjoyable and still plays well to this day. 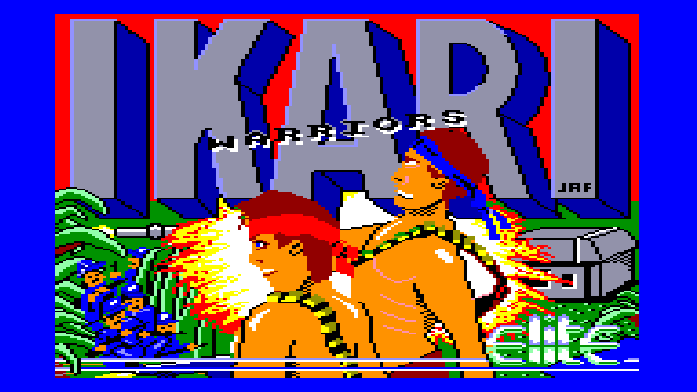 The graphics are colourful and chunky and the sound adds to the ambience all of which make it well worth firing up again. 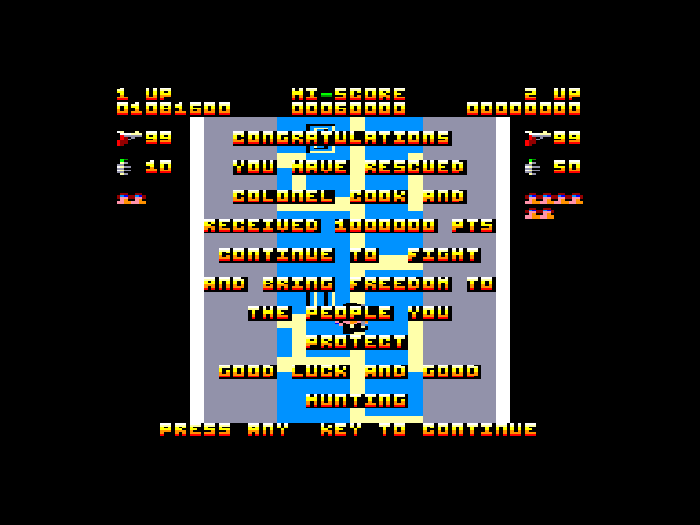 The actual ending of the game is a bit of an anti-climax. …and then it just ends with a bit of congratulatory text. Yes you get 1,000,000 bonus points, which is nice, but you don’t even get to see Colonel Cook let alone that ticker tape reception and big fat promotion you were expecting. But we don’t care, we did it all for the freedom of the people we protect anyway. Imagine your own ticker tape parade.